Before this album has its first play, the words: whiskey, Dakota, levee and Mississippi start to lay the ground for where the destination is likely to be. Yes, it is Americana to the core, although leaning heavily in a blues-infused direction. 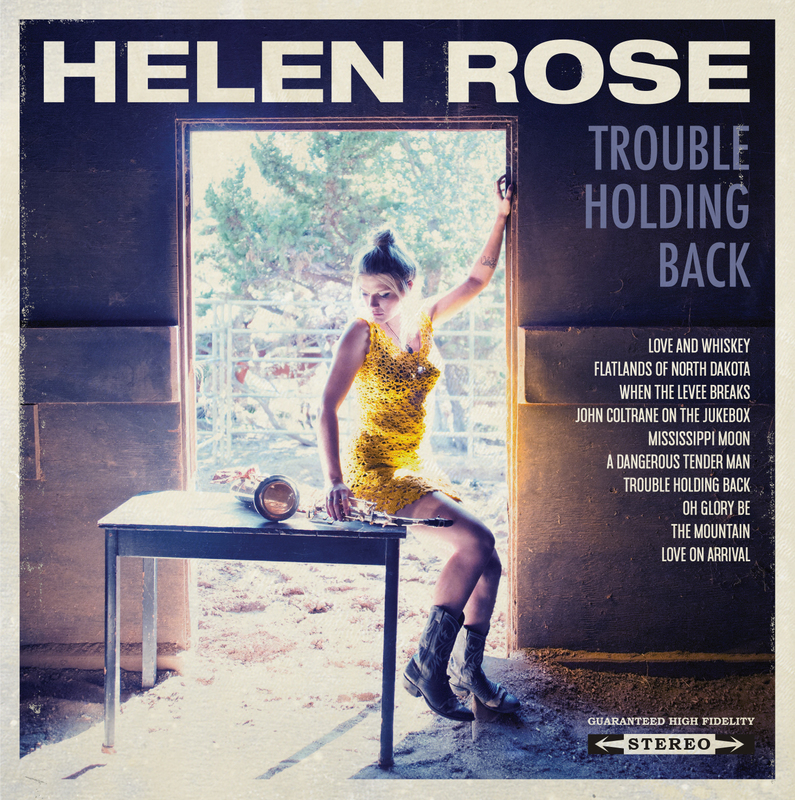 Helen Rose has equipped her impressive vocal and musical credentials with a comfort blanket of the traditional, borrowed tunes and themes rich in the culture of a genre. As a body of work, and indeed Rose’s debut, TROUBLE HOLDING BACK emerges as a commendable effort, stimulating interest, creating thought and settling down as a mighty fine unabated listening experience. One that will have few struggles fighting its way through a cluttered highway of new releases to be heard. It is hard to look past the second track ‘Flatlands of North Dakota’ as Rose assumes the mantle of a modern day Bobbie Gentry to spin a mystique tale, albeit set a couple of thousand miles north west from the dusty delta. An uncanny likeness to ‘Ode to Billy Joe’ opens this track, which proceeds to tell a five-minute story of struggle and making ends meet out beyond the tracks. Rose takes her place in the writing credits on this and a couple of other tracks, alongside showing off her tenor sax skills on a few more. The team assembled to record the ten songs making the album cut have succeeded in creating something recognisable and fulfilling, prompting many foot tapping and head nodding moments. All bound by a vocal prowess that pitches at an optimum listening level. From a traditional perspective, the arrangement of ‘When the Levee Breaks’ enhances the art of passing on the time-honoured song. When borrowing tunes, a version of Don Heffington’s ‘John Coltrane on the Jukebox’ provides a good fit complete with sax solo, while taking on Steve Earle’s ‘The Mountain’ considerably widens the goalposts. ‘Mississippi Moon’ is a solo write from album producer Marvin Etzioni and proceeds to anchor the record in a way that defines how the talents of Helen Rose can put a permanent stamp on a song. Leading the remainder of the originals, ‘Love and Whiskey’ gets the album off to a punchy beginning, while the slightly sinister ‘A Dangerous Tender’ equally stimulates the second half. Further tenor sax opens the title track ‘Trouble Holding Back’ and album closer ‘Love on Arrival’ is a suitable temperate effort to gracefully close the door. Making an invigorating claim for the latter stages’ highlight, the infectiously soulful ‘Oh Glory Be’ provides a joyful touch. TROUBLE HOLDING BACK is a double-edged album to the extent that its first and umpteenth listen retain a distinct appeal. 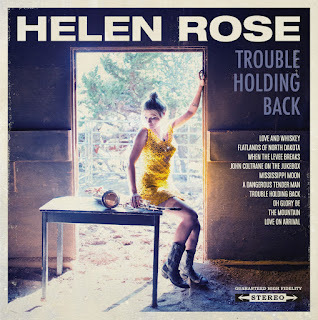 Helen Rose has fully utilised her craft, skill, astuteness and inspiration to share a record rich in its construction and embodying the wide reaching template of Americana. Whether the word ‘debut’ leads to ‘breakthrough’ is in the hands of fate, but sealing the deal with individual listeners ensures that small steps are heading in the right direction.